Eurostar, the high-speed train service connecting London and Kent in the United Kingdom with Paris and Lille in France, and Brussels in Belgium operates Class 373 trains which travel at up to 300 km/h (186 mph) on a network of high-speed lines. 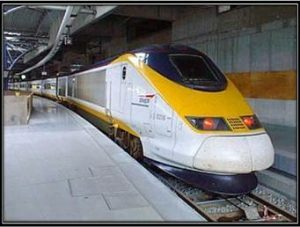 Eurostar trains were designed with channel tunnel safety in mind, and consist of two independent “half-sets”, each with its own power car. In line with company policy, continuous research is carried out to establish the very best means of protecting both rolling stock and passengers while at the same time complying with all current safety & environmental issues – including the Kyoto Protocol which forbids the use of Halon as a fire suppression agent. On behalf of Eurostar, and responding to the Kyoto requirement for legally binding commitments for the reduction of greenhouse gases, Loughborough based Brush Traction researched available fire extinguishing systems such as Water mist, FM200, Novec 1230, inert gases, and condensed aerosol systems as possible alternatives to the current Halon system installed. In their research, they were joined by Nobel Fire Systems Ltd experts in all types of fire suppression systems. This research clearly highlighted the market and product leader was Stat-X®. As such from 2010 to 2012 Brush, Eurostar, and Nobel have been working together to prove the effectiveness of the system to the Channel Tunnel Safety Authority (CTSA) and the Channel Tunnel Intergovernmental Commission (ICG), including a series of full scale mock-up fire tests at the French fire systems approvals and testing authority CNPP based in Vernon France. On successful conclusion and with final sign off from both the CTSA and the ICG, Eurostar awarded the contract in July 2012, due for completion in 2015. The system, which also included the design of a bespoke interface control panel, is designed to protect the power compartment car including transformer, common block, and motor block. Stat-X has been installed in key locations around the power car section of the train, providing superior localized and total flood protection clearly demonstrating the versatility and effectiveness of the system. In the event of an onboard fire, Stat-X generators can be activated either manually or automatically via the integrated dash mounted control panel. On activation, the generators produce an exceptionally effective, ultra-fine, potassium based aerosol. Unlike gaseous systems, Stat-X aerosol generators are cost effective to install and maintain as they do not require the pressure vessels, piping, or expensive installation costs associated with other extinguishing systems. Space and weight requirements are minimal and, in many applications, the compact size of the Stat-X aerosol generators makes them the only viable option. Stat-X aerosol generators are virtually maintenance free and have a shelf life of over 10 years. This, coupled to their low installation cost, makes them an extremely cost effective fire protection solution.